the sbx 2049 fm based drum machine is out! watch the movie and grab it here! Super Instrument, man merkt gleich, Ihr macht selbst Musik! Gibt es vielleicht eine Möglichkeit, die einzelnen Step-Buttons, z.B. 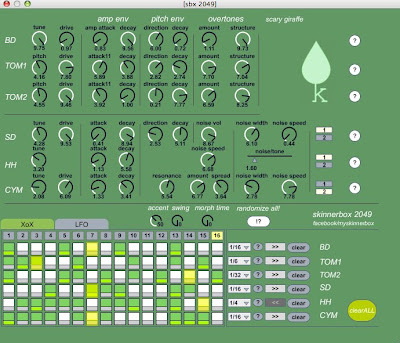 per Midi-Mapping, mit Launchpad o.ä. steuerbar zu machen? hi erwin! for the sake of our none german readers ill answer answer in english, for the moment you can use any step sequencer that you can control with the launchpad/apc/monome and send midi notes c3-f3 to the machine... we might add sequencer remote control feature in the future. Hi guys! This is Amazing Drum Synth!! Thanks for it share:) I'm trying to build a my M4L drum machine, but i tired to find way how to make naturaly base drum synthesis for it, tune, drive, pitch and etc. Where do you study how to build a drum algorithm for 2049? -the ability to blend between different patches. Similar to the long random/morph control, but between specific different patches. That would be amazing. I have used the SkinnerBox on almost everysong in the past one year. Amazing drum synth and FM manipulator. Wish we had a Hardware of Skinnerbox. Thank you so much for this brilliant software.